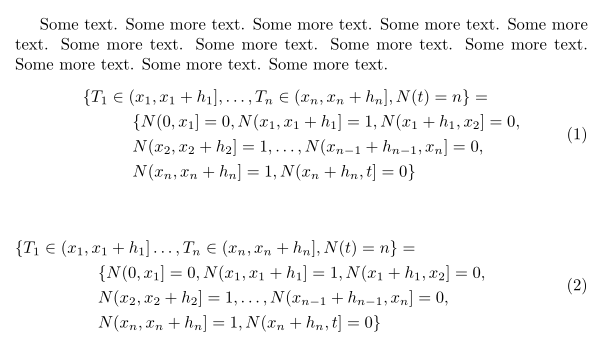 I put this long equation in latex in several lines however when I put Latex into PDF the equation did not appear all. Can I help me? Some text. Some more text. Some more text. Some more text. Some more text. Some more text. Some more text. Some more text. Some more text. Some more text. Some more text. Some more text. I suggest to move the = sign to the second line and to align right of the brace, so to emphasize that the items are in the set description. Making the braces a bit larger may help. Not the answer you're looking for? Browse other questions tagged equations subequations fit or ask your own question. How to split a long equation in Latex?